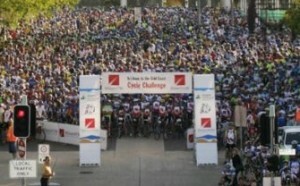 The 2008 Wilson HTM Brisbane to Gold Coast Cycle Challenge took place on Sunday 12 October with just under 8000 cyclists attending. Footbikes were represented in the form of five Kickbikers who took part in this annual cycling event: Bruce, Alan, John, and a husband and wife team, Tracey and Steve. Bruce, Alan and John completed the 100km distance, while Tracey and Steve took part in the 60km distance which joined the Brisbane circuit at Beenleigh. Tracey Lunniss now holds the record for the longest distance (under race conditions) by an Australian Female. Congratulations Tracey! And welcome to Steve Lunniss on his first Australian Footbike Association recognised event. Hopes for setting new time records were dashed as a strong headwind made itself known to the 100k-ers around the 50km mark. But a good time was had by all. And a special ‘thank you’ goes out to Lyn who played support person for the Kickbikers for the day. The organisers of the event arranged good signage and drink stops during the event. We look forward to attending next year. Let me know about the next one!